Historic Hilltop Hideaway...Spectacular 60 Mile Views...One of the few Hilltop Accommodations in Malvern. Amidst the unspoilt beauty of the Malvern Hills this private family run country house is close to Great Malvern and Worcester. Wyche Keep is a true 'Hilltop hideaway' on the Worcestershire Beacon and offers accommodation for the discerning traveller. The property is a unique arts and crafts castle-style house, with spectacular views which extend to some sixty miles. 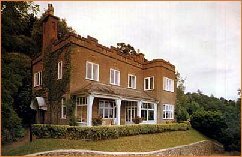 Wyche Keep has a long history of elegant entertaining and was built by the family of Sir Stanley Baldwin, the former British Prime Minister. The maximum number of guests at any one time is limited to six adults enabling a privileged experience with personal service in this exclusive and inspiring setting. Numerous short and long walks can be enjoyed from the house, and Wyche Keep is also ideal accommodation for day trips to the cities of Worcester and Cheltenham which boast many attractions and excellent shopping facilities. There are three luxury suites: two twin-bedded and a romantic four-poster double. Tower Bay is a large twin-bedded room with a private Victorian bathroom. End Wing is in the private north wing and has a double four-poster bed and a spacious adjoining bathroom. Elgar Suite is a charming twin-bedded room with a private shower room. Traditional English cooking is a speciality and guests can savour memorable 4 course candlelit dinners, served in a House party atmosphere in front of a crackling log during cold winter months. Dinner is healthily prepared using fresh produce from the local area by hostess Judith Williams. Game is a speciality but all dishes are of high quality. Wyche Keep has a restaurant and residential licence for serving alcohol - diners can relax with an aperitif on the veranda whilst enjoying the fine views towards the Cotswold Hills or in the comfortable lounge which is reserved for diners. Dinner £25.00 per person (4 courses plus coffee). Christmas, New Year and Easter. Please ring for availability and price.